This Material Is Incredibly Soft And Durable And Creates A Contemporary Feel To The Booth. This Modular Circle Booth Set (as shown) has been fabricated in a standard vinyl with standard table laminates. This modular circle includes 3 separate pieces (we call them “corners”) that are fitted together for a “circle” configuration. All of our diner booth sets include a custom built table and base to match the size of your booth. Complementing this set is a 46″ round table in white, red or black with 1.25″ real metal banding, and a Classic Chrome Column Base. These tables can be done in an endless selection of laminates and includes our real metal table edging. If you wish to customize this set with premium vinyls or premium laminates, please give us a call. Price shown is for Standard Vinyls and Standard Laminates. If you wish to upgrade to premium vinyls or laminates, give us a call and we will build a booth to your exact specifications. Check out the space plans below to see how one of these beautiful pieces will fit into your room. To place an order for one of our modular circle booths send us an email or call 304-728-0547. CALL 304-728-0547 TO ORDER NOW! Modular Circle Booth – $2595 – Add $470 for matching table/base! Our Modular Booth Set is priced above without the table. Please add $470 for a 46″ round coordinating table and base! Please send an email, use our CHAT feature, or call 304-728-0547 and one of our retro specialists will respond right away. We offer a great commercial customer discount when ordering in large quantities. 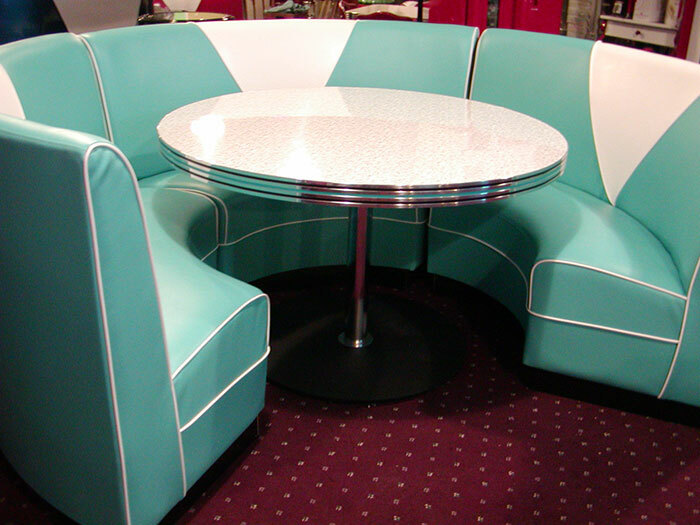 Let us help you build your diner or retro restaurant. Please allow 4-5 weeks for production of the Modular Booth series.